Part 2 of the Death Education for Health & Wellbeing series is this important workshop on understanding grief. 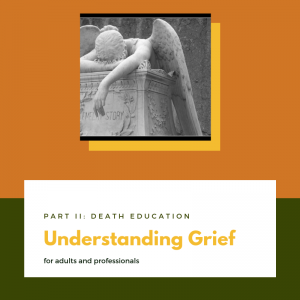 The class goes much deeper into why we grieve in different ways and furthers the cultural understanding of grief that was touched upon in Part 1: How to talk about death in healthy ways. This workshop comes with five hours continuing professional development certificate, workbook, interactive exercises, good grief leaf, lunch and refreshments. Perfect for anyone who will need to support a bereaved person whether they are a client, student, colleague or loved one. To find a workshop look at our Upcoming Events.